This website contains a growing inventory of items currently in the exhibit, as well as a wishlist of items we’d love to include. If you see something we’re missing, or if you find something you think would fit our theme, please get in touch with us. Finally, as you explore the exhibit, we encourage you to share your pictures, comments, or questions on social media using the hashtag #umwconsole. You may also leave comments on blog posts or item posts on this website, and follow @umwconsole for updates. The present and future of media technology builds on a history of technologies, and understanding the present and preparing for the future benefits from engaging with the material specificity of technological artifacts from that past. Around the world, museums and other cultural institutions are preserving this history for future generations. Our living room is indebted to those collections that have inspired us, like the Media Archaeology Lab at the University of Colorado Boulder, the Learning Games Initiative at the University of Arizona, and the Vintage Computer Collection at the University of Maryland. 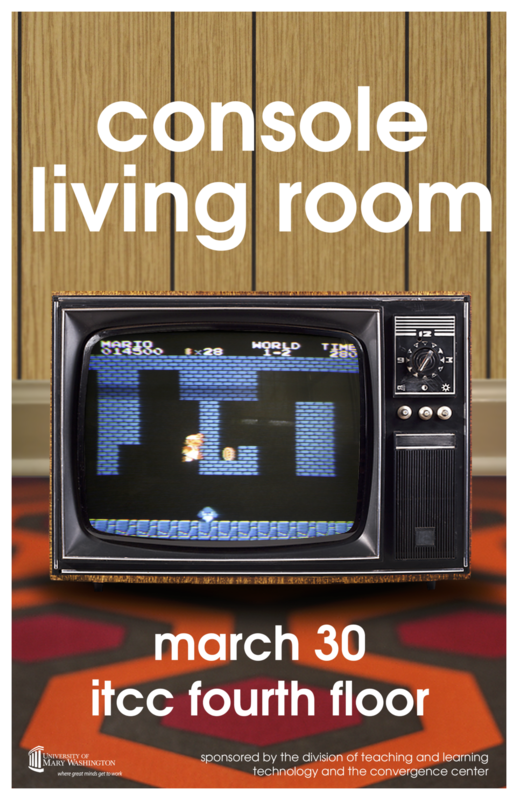 Moreover, Jason Scott’s efforts through Archive.org to universalize access to console emulation (popularized in a similarly-named but unaffiliated “Console Living Room”) have helped articulate the importance and broad appeal of preserving access to obsolescent software and media. Where our Living Room Console differs, however, is in making accessibility and situational historicity our driving principles. Each item in our inventory is simply available for anyone to play with. When the building is open, the living room is open. While this does probably pose some risk in the sense that some of this might get damaged or even stolen, it’s worth remembering that these were mass-produced consumer products and all would be relatively easy to replace. Of course, we hope we don’t have to. Kenny Horning and his theater workshop students, Jeff McClurken and Cartland Berge for allowing us to use the space, Becky Bezdan for use of the Zenith television, Joe McMahon for Asteroids, Sue Fernsebner for Yar’s Revenge, Tim Owens for E.T: The Extraterrestrial, Gwen Hale for the beanbag chairs and shag carpet, Matt Gaughan for Castlevania, Battletoads, Metroid, Punch-out, Contra, and Super Mario Bros. 3, Jon Pineda for carpentry assistance.